You Are Here: Home > FAQ > Blogs > The "meta-stock" agency. There's an interesting new business model emerging that I've taken notice of that so far doesn't have a name, so I named it a meta stock agency. This is where a website mines the photo assets of one or more photo agencies or social-networking sites, and licenses those pictures. The idea is rather obvious--it hopes to act as extensions to microstock agencies by helping them sell their photos in exchange for a slice of the pie. This model is not to be confused with a different business model that I proposed in my blog titled, The Virtual Stock Agency. In my model, members from within a photo community (say, a microstock) would be able to make their own business by acting as editors of the site's raw photo content. They would, in essence, act much like a regular agency by creating packaged products or services that would help sell the underlying photo assets. The economic incentive for virtual agencies would stimulate more sales than what current microstock sites can do on their own. What's the difference between a meta agency and a virtual agency? It's the business model. Neither actually hosts images--they get them from other existing photo sources. While a meta agency may "access" photos from one or more sites, it does nothing more than present the same search results you'd get if you did the search on the original hosting site itself. By contrast, a virtual agency implies human creative effort (as described in my blog) that promotes photo sales beyond what the hosting agency can do on its own. There's no conflict between a meta agency and a virtual agency; in fact, a company can be both. The "meta" aspect simply indicates that the photo assets my come from many sources, and the "virtual" aspect defines a business model that involves "productization" --that is, converts the "raw material" into something that helps it sell better. We haven't yet seen either on the web yet, but we are seeing several meta agencies emerge, as I'll enumerate soon. Let's begin by understanding how a meta-agency works. For a site to access photos from another site, it needs a way to get them. That part's easy. Flickr, for example, has a set of network utilities that allow programmers of other sites to access its content, which, till now, has largely been to demonstrate that it's "possible." There are various sites that pull Flickr images and present images that have certain characteristics, image features (such as colors), "popularity" values, and, of course, boring old keywords. The discussion board on Flickr's site for these users is humming with tech talk about cool things to do, with links of cool sites that pop up every day. Many photo-sharing sites have public access methods that programmers use to access their photos--in fact, "programmer access" is the hot new buzzword in the social-networking industry, ever since facebook.com introduced theirs, and by consequence, is about to bypass myspace.com in visitor traffic. Giving outside users powerful tools to access data in your site is proving to be the next big wave in the internet. So, while there are many sites that access data--and in this case, we're concerned about photos--what classifies a site as a meta-agency is the fact that it also sells those photos (ie., licensing). Combine this possibility with the rapid growth of third-party access to those photos, and you have what will ultimately be a major hub of economic activity in the photo industry. And while that sounds enticing, the business of a meta agency comes with some difficult problems that can affect everyone in the industry. So read on. This simplest of the three performs a search of user-input across a number of different photo sites, and sends the prospective buyer to the hosting site. In a previous blog, I mentioned a9.com as just such a company, who've been doing this for quite some time. Currently, they don't have a business relationship with the sites they send visitors to, but it's conceivable that they could (if their traffic became a significant factor). This involves doing the search defined in (1), but also complete the license transaction on behalf of the hosting site (in exchange for a revenue share). www.picturesandbox.com (used to be called "flickrcash.com") is such a site. It lets you search for images from sites like Flickr, Smugmug, Lucky Oliver, YouTube and other social-networking sites. But, unlike the sites that it pulls its images from, picturesandbox will actually let you license the pictures returned from your search criteria. To be precise, they don't really license photos, as they do not have a relationship with the photographer. They sell "license documentation," as Dr. Augustine Fou, CEO of the company, explains. "We are the notary (date and time stamp from NIST Atomic Clock) and we are the digital document archival service." In other words, if you use an image that falls under the creative commons license, you don't really need to "license it" from anyone, but Dr. Fou's business will generate and archive an electronic document of the otherwise-public license as proof that your use of the image is "legitimate." This, to protect you in case a claim were ever made for copyright violation. The fee for this documentation archive: $9.99 per image. Clearly, this is a new business, so their revenue structure is likely to evolve beyond just archiving documents, but it does represent a pioneering effort. In this case, rather than doing (1) or (2), build the technology to mine the photo assets, and then license it (in whole or part) to other companies, either the stock agencies themselves, or sites that want to be meta-agencies. This business follows the more traditional software license model. One such player in this area is www.xcavator.net (careful not to use the 'e', as in 'excavator'). Like the others, they mine photo assets of other suppliers, but not using their published access methods. Instead, they only partner directly with photo agencies--so far, they are working with PhotoVault (and looking to expand their but only partnerships with other photo agencies, not photo-sharing sites). In their case, they're trying to promote the value of their image-recognition technology and build more of a B2B relationship. I'll get back to Xcavator later. So, what does all this mean to the industry? What value-add do meta-agencies serve that make them better destinations than the original hosting sites? One potential and obvious one is that sites like Flickr that don't (yet?) license the photos they host. So, the value-add could be the ability to do just that. But other hosting sites, such as existing microstocks and others where users can already license the images found there, the value-add is less obvious. In purely economic terms, the need for some sort of middle-man in the supply chain is clear. Photos are still considered "raw material" purchased in the same ad hoc manner as an auto mechanic who goes to a junkyard to find a part for a car. Need a radiator cap? Or just a photo of a radiator cap? Go to your local heap of crap and start kicking through it. So, the business opportunity for a meta-stock is ripe. But, that doesn't guarantee success. This model is littered with all sorts of gotchas along the way, and navigating through the mine field will make or break all these players. At the forefront of all this is the pivotal question: does a meta-agency help find photos better than the sites that already host them? Or do they just contribute to the flotsam? It may be too early to say for sure, but one thing is clear, players are stepping to plate to see if they can pull that sword out of the stone. Because they are young, current meta-agency sites do little more than return exactly the same search results that the hosting site provides in the first place. If the user does a search for "future," the image results will only be those photos that the original hosting site determines is a match. What the meta-agency does with those results may vary, but it has to start with the initial set of pictures it was sent in the first place, which might be pretty poor. This goes back to an earlier article I wrote a couple months back about the perils of bad keywording habits by end-users. A meta-agency can't do better than the search results it's been given (and which it got returned from the image hosting site). Xcavator's approach is unique in that it embeds itself into the hosting site's search mechanism itself. It can act either as the search engine, or operate along side it. Xcavator's claim to fame is visual-recognition, not keyword search, though it can do that too. For example, you can select a photo of a woman or a train, select artifacts of the photo that you want, and you'll be given a set of images that have similar artifacts. Skin tone, racial features, color combinations, window trimmings, shapes, etc. Cool stuff, to be sure, but the question is whether this kind of search translates into more sales. And if so, how much more? For a photo agency (large or small) to afford to share its minuscule margins with a third-party partner, the additional revenue must offset the cost of the relationship. As it is, margins are too thin to spread across multiple links in the supply chain, so this is a high bar to clear. As Shakespeare's would say, "Therein lies the rub." So, the economic challenges for meta-agencies are two-fold: 1) to actually provide a technically useful solution, and 2) to make it economically viable for a photo-hosting company to partner with it. The second case is a problem now, but not for the reason everyone thinks. That is, most people believe that competitive market pressures have kept photo prices low. But that's not the case. I've argued repeatedly that microstocks don't paint a realistic picture of what the market will really pay for photos, largely because they make the great miscalculation that the buyer chooses photo sites based on price. They don't. People come to a site because that's the site that came up in a photo search on a standard search engine. Mountains of data prove that 90% (or more) of buyers end up at a site because that's where their search engine sent them, and if they find what they want there, they usually buy. My own site is a prime example: I license images for hundreds of dollars per image (on average) for no other reason than my site happened to be the one people landed on when they did a search for a term in a generic search engine. If it were all about price, I wouldn't make any money, nor would Google be making billions of dollars selling ads to people who want to be found in search results on their pages. If a photo meta-agency could generate more traffic than the photo-hosting sites themselves, that would make them a more interesting partner. But unless that happens, the same money is just spread around to more players, cutting the same size pie into thinner slices. This doesn't sound like a business model that will last very long. How you get traffic is the elephant in the middle of the room. But it doesn't happen because you have low prices. This means that a meta-stock site has to somehow find ways to generate traffic. While that's an obvious statement, the implication is that, unless they do, the future of the meta-stock business model is dim. Does search translate to sales? Of the three models of meta-stock that I described, which has the best opportunity to monetize photo content? Working backwards starting with the licensing model (ie., xcavator), it's my personal opinion that this approach is several years too soon because there is no real indication that their particular brand of search will both increase traffic and convert searches to sales. At least to the degree necessary to offset the cost of splitting the revenue pie into more and thinner slices. To justify sharing revenue with another players (such as xcavator), they need to present tangible data proving that conversion rate. Until then, the risk of that speculation is too high. Make no mistake, I fully expect there to be in the not-too-distant future a very clear business case for investing in better image search. I've written about how a future differentiator between photo agencies will be the ability to come up with more relevant search results for photo queries than what are produced today. But that won't come in one big swoop, or in fancy visual-search fashion. It will be incremental, and the early steps will come as a result of 1) better keywording by users, and 2) a broader adoption of hierarchical keywording syntax to allow descriptive context to existing keywords. In other words, it's more important for photo searchers to avoid getting false-positives from search phrases, than it is to find precisely the "right" image from a set of 50+ otherwise identical pictures of the same woman. You'll know that we're there when a search for "dental bridge" doesn't result in photos that include a kid smiling with big teeth standing in front of the Golden Gate Bridge. Solving this problem will affect buying behavior more substantially in the short term. When that problem is solved, future PR pitches will come in the form of "we'll come up with the images you need in fewer clicks," which will replace the ridiculous claims they use today, such as, "we have billions of images!" The only reason they still use that silly marketing line is because they have nothing else to say. It's like saying that Hostess Twinkies are "caffeine free!" Like that makes a difference to buyers! But, what else can they say? Hence, with all due respect to xcavator's search technology (driven by the brilliant patents developed by cognisign.com), it's "a solution looking for a problem." A tough nut to crack, but then, making money is hard, so what's new. As for the second option--being a meta-agency--it has great promise, provided it does more than just lay a technical foundation for accessing and presenting the same photo data you normally get anyway. The first option of just being a meta-search site that sends users to the hosting company is just as easy as being a meta-agency, but its main advantage is that it's simpler business model; the thinner margins are more than offset by the avoidance of the more serious issues that I'll cover next. A meta-stock agency "can" exist, but will it stimulate growth of the industry? Will it cause people to license more images? Will it help traffic? Does it raise the bar on how photo licensing is done? Does it address the user-participation objective? Are there other hurdles to overcome? The user-participation objective is problematic for two core reasons. First, there are no "members" of a meta-stock agency, so the social aspect of photo-sharing and microstocks is completely removed. No one has a reason to go to a meta-stock agency, other than to search for photos. And no one (other than photographers and photo industry analysts) will know they exist unless search engines bring people there, or unless mass marketing dollars are invested into mainstream media. We know that won't happen, so that requires a dependency on search engines. Yet, they won't bring traffic unless there's content or interactivity or some other "thing" that gets people to talk or write about it. Since none of that is happening, what's going to contribute to growth? The first thing a meta-stock site needs to do is offer something to "do" other than just search for images. Oh, sorry, you can do one thing: license photos. But that in itself doesn't attract users--it's the by-product of users having already arrived. Otherwise, it's just another junkyard full of the same stuff available at other junkyards... which only makes it harder to find what you really need. Now, this is not to say the idea is bad, just ... embryonic. Having a site that gets photos from another site for licensing is not a business unto itself, but it could be a good platform from which to build other activities that actually bring the users and the effervescent "buzz." For example, my proposal for the Virtual Agency would easily fit into a meta-agency framework. Members sign up and create packages and collections of photos, and these would be unique because 1) they are comprised of content from many sources, and 2) they are hand-picked, presented, and packaged in a way that compels visitors to not just see, but to participate in the process as well. (Remember, they make money too, if they can get people to buy.) This not only brings a lot of people and traffic, but increases the likelihood that traffic converts to sales. We've established that building a meta-search site, or meta-stock agency is technically simple. And we also covered the financial hurdles associated with making the business case to potential partners that it's worth their sharing their margins with you in exchange for your services. But there's one more hurdle to clear: the legal liabilities. Who actually has the legal right to license the very photos being served? Under what conditions? What measures are taken to assure photo ownership and copyright? What documentation is there that the human who makes these claims actually exists? Who bears liability if something goes wrong? To illustrate, I went to picturesandbox.com and searched for images I knew would match my own photos at Flickr. (I searched for "star trails.") Sure enough, they came up as expected. I then clicked the license button on one of my images, which allowed me to not only download the image, but granted me permission to use it. If you don't immediately see all the red flags flying onto the field by all the referees, you're playing the wrong sport. As you might guess, I do not give Flickr or anyone else the right to license my photos. We'll get to that in a sec, but for the moment, the first issue to address is establishing the relationship between the photographer and his photographs. Or, at least, the photographs he submits. (Hint: they may not be his.) This, for both financial and legal reasons. Because of the meta- nature of picturesandbox and its polling of image assets from various sites, it has no idea whether the images it receives from the host are genuinely "available" for licensing. It has to trust entirely that the hosting site returns images that match a given search, and that the images it returns can be licensed. This raises the ultimate question of who bears the legal liability when something goes wrong, such as copyright violation (as illustrated in my earlier scenarios). Granted, this is currently a bug on Flickr's side that's easy enough to fix, but imagine the huge legal liability they set themselves up for if images were actually released because they gave the wrong license attribution? If someone had gotten my image and used it in a high-profile manner, for which I sued them for copyright violation, someone's going to pay for that. This would eventually cause the defendants to point to Flickr. Ok, so that won't happen anytime soon because they'll fix the bug that they give the wrong attribution for a photo's license status. But, this is only a foreshadow of problems looming ahead. Let me state up front now that I'm going to continue these scenarios with a focus on Flickr, but this is not unique to them. It just so happens that their prominence in the market also serves as a model for others to follow, which means they deserve more scrutiny than other sites. But, rest assured, they are not being singled out here. With that out of the way, let me continue with the scenario by adding one step more: my images are all over other Flickr members' "photo streams" (as are pictures from other users and other websites) because anonymous, ordinary people copy pictures all the time and put them on their Flickr pages. (yes, and on other photo-sharing sites and microstock sites, too.) These users could just as easily indicate that the (stolen) photo is available for licensing, even though they don't own the photo. So, what of those "stolen images" that Flickr is making available to other sites who are licensing them (assuming that this is legal)? If Flickr expressly forbids this kind of use with their API, then Flickr is absolved, and the meta-agency inherits two problems: first, they are in violation of the terms-of-use of the API, and they are also next in line for responsibility in the event that photos are illegally licensed. Now, if Flickr is engaging in third-party relationships like those described here, and it is knowingly allowing meta-agencies to use their APIs to access Flickr photos for the purposes of licensing, this changes everything. Then the issue of stolen photos becomes front-and-center for the company. Note again that Flickr is not known to be doing this. But other photo-sharing sites may be in similar situations, which means that it's important to follow the principles outlined here. Alert readers may be thinking that the Digital Millennium Copyright Act (DMCA) specifically protects hosting sites like Flickr and smugmug from liability for copyright infringement. This is true, but under some very restrictive terms. Not protected is the selling or licensing of copyrighted material. The fact that commerce comes into play is what changes matters entirely. For example, Google is in a legal skirmish with Viacom in a high-profile lawsuit because copyrighted TV shows can be seen on YouTube. Google is protected by the DMCA because the photos are posted by end-users, and the use of that content is not under google's control. But imagine if Google posted on its site, "you can use our API to download videos and use them in commercial contexts so long as the person who posted the video says you can." Well, DUH--anyone that steals videos and who can remain anonymous will attribute unreliable license terms because they don't care. Raise your hand if you think a judge is going to allow Google to get away with that? The DMCA would never protect a site from that kind of activity, and this is exactly the problem that a photo-sharing site (like Flickr) would have right now if it engaged in business relationships with "meta-agencies." In doing my homework on the matter, I contacted several of my usual lot of lawyers for opinions. Again, no one sees anything that would suggest Flickr is doing anything wrong at the moment (but what we don't know is critical here). And remember again, this article is not just about Flickr--I'm just using them to illustrate broader issues facing the stock and meta-stock business model. That said, if Flickr (or any other photo-sharing site) were to get into the business of allowing third-parties (meta-agencies) to access their content, this ratchets up on the priority list the need to assure that members who submit photos are duly notified about what they're doing. In looking at Flickr's "licensing attributions" more closely, which could (and do) look pretty similar to other photo-sharing sites, they say that "you should add a license to photos you have taken yourself," which is somewhat incomplete and rather misleading. In effect, Flickr is telling members to permit others to use your photos, even though this is probably not what the user really wants to do. If most users were aware that by doing so, they may be allowing others to profit from their photos without any renumeration back to themselves, they probably wouldn't allow it. Or, at least, they'd be upset that they weren't more clearly advised of it. Flicker users can instead choose the "None" option for licensing, which is the default. This tells Flickr that you're not giving other people the right to use your images. 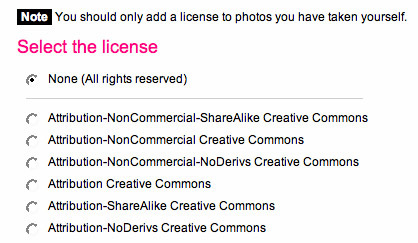 The problem is that directly above that selection is the text that advises you to use the one of the "license" options if the photo is yours, thereby dissuading you from checking "None." What's more, an unsophisticated user could interpret the "None" option as one that places "no restrictions" on the use of images, which is not what that means. (The "All Rights Reserved" phrase goes over most people's heads.) In a non-scientific survey of family members, everyone assumed that you need to select one of the "license" options to protect your images in some manner. A better test of whether end-users really understand it is to assess the current ratio of users that selected one of the creative-commons licenses, and then change the text that "advises" what the user should do, and see how that ratio begins to change. If it is the intent of the end-user to protect his images, a reasonable person (such as a judge), could be convinced that the average person would misunderstand the terms Flickr is presenting, which could make them appear less than virginal. I'm no lawyer, and I cannot predict the actual legal arguments--or outcomes--of any case, but I have a pretty good business mind, and the larger point isn't the legal argument--it's the public relations mess for everyone. No one wants to license photos from a place that might result in their getting sued by photographers who claim copyright infringement, hell-bent on making someone pay dearly, all because they didn't really understand the license terms as Flickr presented to them. I'm guessing Yahoo doesn't want to spend their money on lawyers defending these things on an ongoing basis, even though they may be right in the end. This kind of fiasco affects everyone in the supply chain. Yes, including the meta-stock site that may be the innocent bystander in all this. Disclose third-party license agreements to members. While Flickr is tight-lipped (to a fault) about discussing any of its future plans vis-a-vis licensing photos, it is going to have a very rocky road ahead of it if it doesn't prepare for whatever future it may have by fixing up some of these matters now. It should make formal statements about whether it has engaged in such relationships with third-party entities that may be licensing photos, especially if no such agreements exist today. As a social-networking site, Flickr and smugmug and many others enjoy the full protection provided by the DMCA, but entering into business relationships that allow others to license photos is another matter entirely. Verify identities of members who contribute "licensable" photos. If a site is going to permit photos to be licensed (either by themselves, or through third parties), the identities of the owners of the photos need to be known before they are served to third parties. In addition, that person needs to warrant that he does, in fact, own his photos. Granted, people may lie, but at least it eases the burden of responsibility of the photo-hosting site if it can demonstrate that it has good, sound procedures in place, and that it takes the matter seriously. Require users to specifically check a box for photos that aren't theirs. The DMCA already requires sites that host user-generated contact to have a policy that provides methods for copyright owners to notify the company of copyright violations. So long as the site is a social-networking (photo-sharing) site, this is sufficient. However, if the company is also going to engage in selling or licensing this very content, it would be a good idea to have members voluntarily indicate whether they own the images they submit, which makes them subject to purgury if they lie. It's not illegal to upload photos you don't "own"--indeed, the vast majority of all photos on the internet do not carry any sort of restrictions, especially for use on photo-sharing sites. Indeed, many owners do, in fact, knowingly choose the "creative commons" licenses for their images, which permits anyone to upload them to other sites (along with many other uses). But a photo-sharing site that permits third parties to licenses its content can relieve itself from many future headaches if it simply offers the user the option of selecting a checkbox that indicates a photos isn't theirs. The above illustrates simple, but important examples of how the industry is still very immature, and kinks like this need to play out before proceeding to the next evolutionary step. The real challenge of making a meta-stock agency isn't the technology, it's making the site interesting enough to get users to participate and engage in it, so as to generate traffic. Equally important is working through details like photo ownership, copyright, model releases, and so on. My recommendations for dealing these issues are all found in many articles I've written on my blog, so I needn't rehash them here. The ones who succeed at the business will be those who know how to monetize those ideas effectively. For example, my recommendation to Augustine Fou of picturesandbox was to invite photographers to register with his site for an annual $5 fee, paid for by a credit card, which assures a user's identity and provides credible warranty that the photos that may come up in search results are their own. This not only dramatically minimizes the likelihood of getting fraudulent photos, but provides an accountable face to point to in the event of a legal problem.